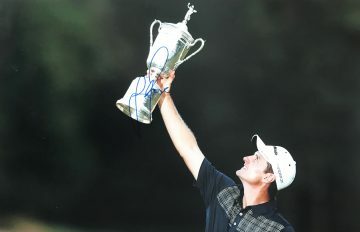 Shop our signed Justin Rose golf memorabilia including autographed golfing items from Britain’s star player. Signed Justin Rose golf shirts, gloves, photographs, caps and clubs. All with Fast worldwide shipping, free UK delivery and Certificate of Authenticity. Most with signing proof! If you’re searching for golfing legends, you won’t find many names more prolific or well-loved as Justin Rose MBE. The English sports star has a whopping 28 tour wins under his belt – alongside one US Open win. Born in South Africa, Rose moved with his family to England at the age of five. Almost immediately he began to play golf near his home in Hampshire – showing early promise and skill that excited those around him. He broke 70 for the first time at the age of 11 – boasting a plus 3 handicap by the tender age of 14. He then made his debut at the Walker Cup aged 17. It was at this time that the young golf prodigy rose to worldwide prominence, finishing in a tie for fourth place. One day after, he turned professional. Despite the early high, Rose struggled at the beginning of his career, missing the cut for his first 21 consecutive events. Despite this ,he battled through and eventually became established on the European Tour opening the season with two second-place finishes in a row. Ups and downs ensued – and over the course of a decade, he slowly rose through the ranks. In 2012 Rose beat golfing legend Bubba Watson to celebrate the biggest win of his career to date. He returned to the world top ten ranked seven, following with recording his best-ever performance in a major championship at the PGA Championship. That year he also beat Lee Westwood and Tiger Woods. 2013 saw Rose’s first US Open win – his maiden championship victory. In 2016 he won gold at the Rio Olympics – the first golfer to do so in 112 years. This was the catalyst for his OBE honour in 2017. Most recently in 2018 Rose returned to World Number One, earning $1,166,660 in prize money. 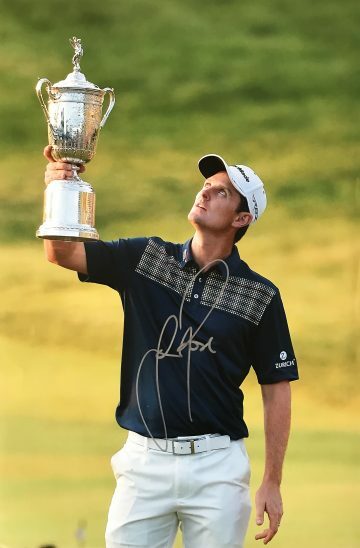 Find a fantastic selection of signed Justin Rose golf memorabilia here at Firma Stella. Choose from signed Justin Rose caps, photos, gloves & clubs – all autographed by the man himself. We carefully source each item independently and supply with a certificate of authenticity for full peace of mind.